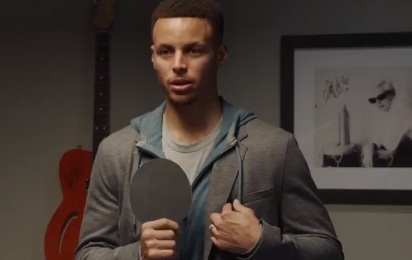 After the teaser announcing that Serena Williams and Stephen Curry will face off in a ping-pong match, we can now see their ping-pong match, in the latest commercial released by Chase. The 90-second spot, promoting the bank’s mobile app, that allows users to “pay back with a tap”, features the “Baby-faced Assasin” and “Mama Smash” in the battle of the paddle, while they’re waiting in a green room. “Do you play?”, asks Curry, with a paddle in his hand, to Serena, who was already there, engaged in a phone conversation. Without saying a word, she stands up and starts to play with the Golden State Warriors star. When the latter hits the ball hard against the wall, Serena decides to give her best, as well. Their “battle” intensifies, the background music intensifies, and things begin to break. First, a glass lamp shatters. Curry takes out his phone and sends $120 for it to Chase via QuickPay, then continues the game. As they keep playing, sounds of exertion and destruction can be heard from the neighboring rooms. Of course, the two cause more damage, including a star hung on a wall, that Curry says it ain’t on him, determining Serena to do what Curry had previously done, namely take out her phone and send the star’s equivalent value ($250) to Chase using the bank’s mobile app. “Use the Chase mobile app to send money in just a tap to friends at more banks than ever before.” – says the voiceover as the spot comes to its end, adding the bank’s tagline, “Helping you master what’s now and what’s next”. The song used in the ad is the 2016 single “Move” by English musician Rat Boy (Jordan Cardy by his real name). The Chase Mobile app, described as “convenient”, “fast”, and “secure”, allows users to pay from virtually anywhere, without cash or checks, with the guarantee that their money will arrive in moments, even to friends at a growing number of banks.